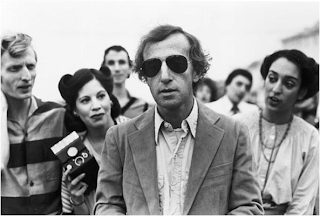 Misjudged as a slap at his fans and widely panned on its release in 1980, Woody Allen's Stardust Memories finally seems to be escaping the tarnish of its initial reception. Even without considering some of the director's shakier misfires to come, this arty, funny take on one filmmaker's struggle with his own limitations deserves a place among the Flawed Classics in the Allen pantheon. A serio-comic homage to '60s European cinema, Stardust Memories tracks a day or two in the life of Sandy Bates, a successful comedy director overwhelmed by the world's suffering, his own mortality, and his inability to do a thing about either—in other words, the usual Allen preoccupations. Caught at a crossroads in both his personal and professional life while attending a filmmakers retreat with adoring critics and fans, Sandy seeks escape in surreal reveries about his past and in the allure of a pretty cellist (Jessica Harper). She reminds him of a past love, the troubled Dorrie—played in flashbacks by a luminous Charlotte Rampling—who Sandy has never entirely gotten over. This of course complicates things with his current girlfriend, Isobel (Marie-Christine Barrault), a French earth mother of two who represents sanity and stability but also a level of commitment he's not sure he's ready for. If you're already a Woody fan—especially of his early, funny work—then Stardust Memories will no doubt keep you amused. 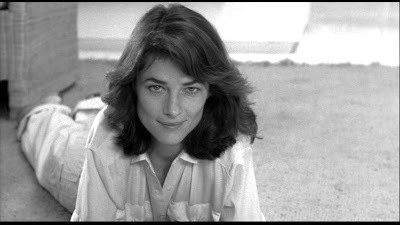 But there are other rewards to be had, including some surprisingly laugh-out-loud lines, an electric performance by Charlotte Rampling, and Gordon Willis' shimmering black-and-white cinematography. Willis of course was responsible for the equally iridescent Manhattan and would later bring his magic touch to Zelig and Broadway Danny Rose, but there's something especially haunting about the contrasty depths of his images here. That extends to his treatment of Rampling, who brings her own haunted quality to Allen's archetypal dark, neurotic beauty. You can't help but fixate on her restless, defensive gaze—most memorably in two emotionally contrasting scenes where the subject is as much her beauty as her character's place in Sandy's memories. Those scenes will stick with you, as will a number of other evocative images. 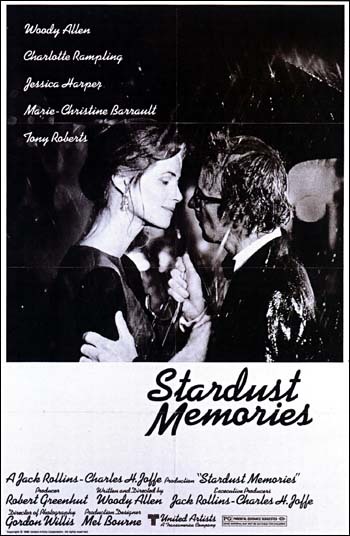 And if Stardust Memories doesn't quite achieve the home run status of a Manhattan or Annie Hall, it's certainly a solid triple. Catch it before it's gone. NOTE: If you're considering purchasing the DVD, please support this site by using the link below. Thanks.